Thamara malayalam movie directed by debutant Prakash Vadikkal featuring Aparna Nair revolves around the life of a fisherwoman who belongs to the traditional fisherfolk living on the Kerala-Karnataka border. 'Thamara' addresses social issues like environment protection and women empowerment. The shooting is being carried on and around the Pazhayangadi River in Muthil, Kannur. While talks about environment protection and women empowerment are at their peak, a movie based on eco- feminism concept is getting shaped. THe movie titled 'Thamara' is an offbeat movie directed by debutant Prakash Vadikkal. Aprana Nair plays gives life to the title character of 'Thamara', a fisherwoman who belongs to the traditional fisherfolk living on the Kerala-Karnataka border. 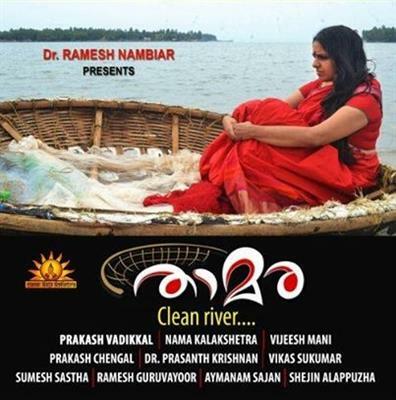 The story of the movie zooms into the necessity to keep our rivers clean and women empowerment. The shooting is being carried on and around the Pazhayangadi River in Muthil, Kannur.The story is told through visuals shot from the riverbed. Along with theatre artists, most of the actors in the movie are real-life fishermen. It is all about the life of the people belonging to the community that fishes on coracles. They consider coracles as their home and casually move on it having coffee or chatting while fishing in the river. With a social message to keep the rivers clean, on 20th December 2014, Vijay Biju, one of the actors of the movie went swimming 20 kms in the river at a stretch attempting to break the world record of 19 kilometers. 'Thamara' is produced by Dr Ramesh Nambiar under the banner Nama Kalakshetra. Aparna Nair, who made her acting debut through 'Nivedyam' was lucky enough to be a part of many popular movies. Her major appearances were in 'Cocktail' 'Ammanilavu', 'Kayam', 'Beautiful', "Mallu Singh', 'Thattathin Marayathu', 'Run Baby', Poppins, 'Immanuel', 'Streetlight', 'Hotel California' and 'Mumbai Police'. She is currently shooting for 'St Marysile Kolapathakam', a crime suspense thriller scripted and directed by H N Shijoy. The movie revolves around the murder of a woman which takes place in St Mary's Working Women's Hostel. It also reported that Aparana dons the role of an advocate in the upcoming thriller 'Blue' helmed by Venu Nair.